It's Feature Day over on the YNS Blog. The DT have created some super fun projects around this months theme of "Make a Wish." 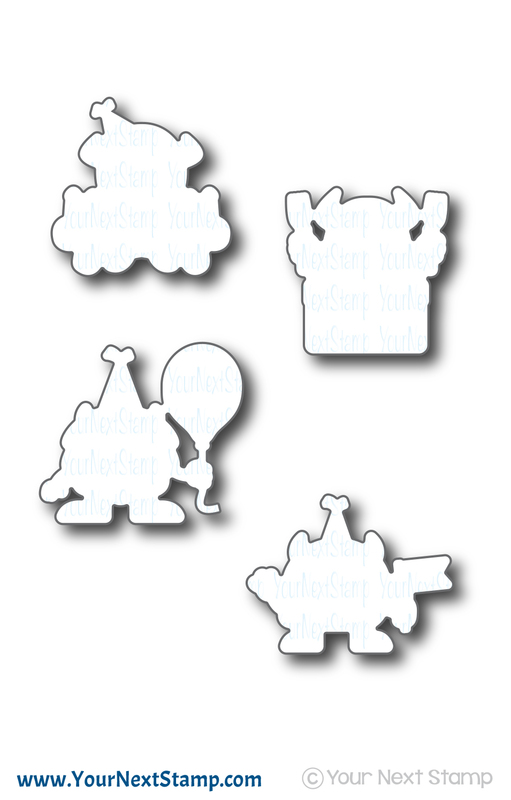 There are so many sets in the YNS Store that is perfect for this theme. 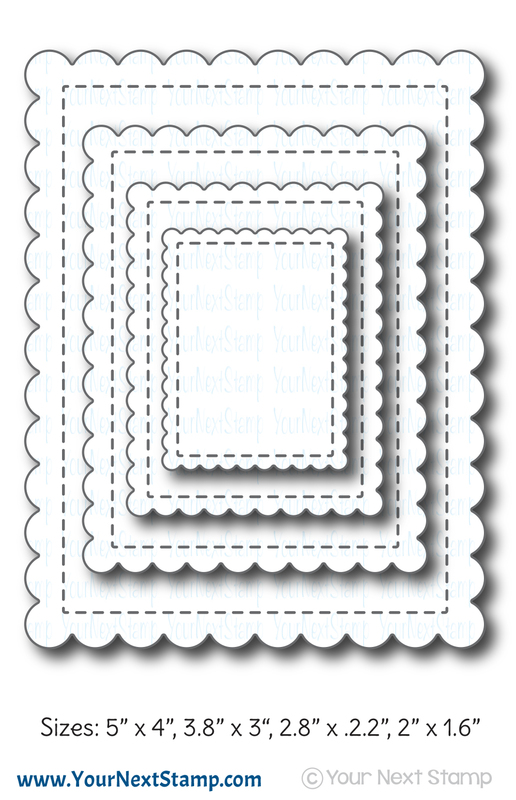 I am using this months new release set of Starburst Background to create this CAS card. 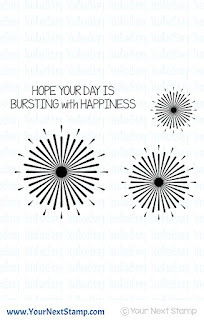 Using Momento inks, I created the corner bursts leaving some room in the center for the sentiment banner. The 3D banner die used in this card has retired but I always love using it. The card was finished with some Silver Tinsel gumdrops for some sparkle. 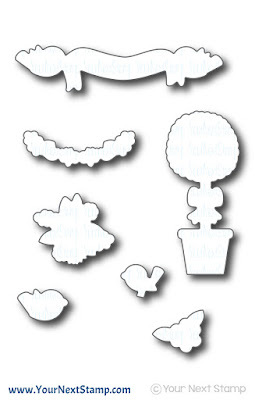 This set is a perfect accent to other stamp images such as a sun, candle, balloon, etc. The possibilities are endless. 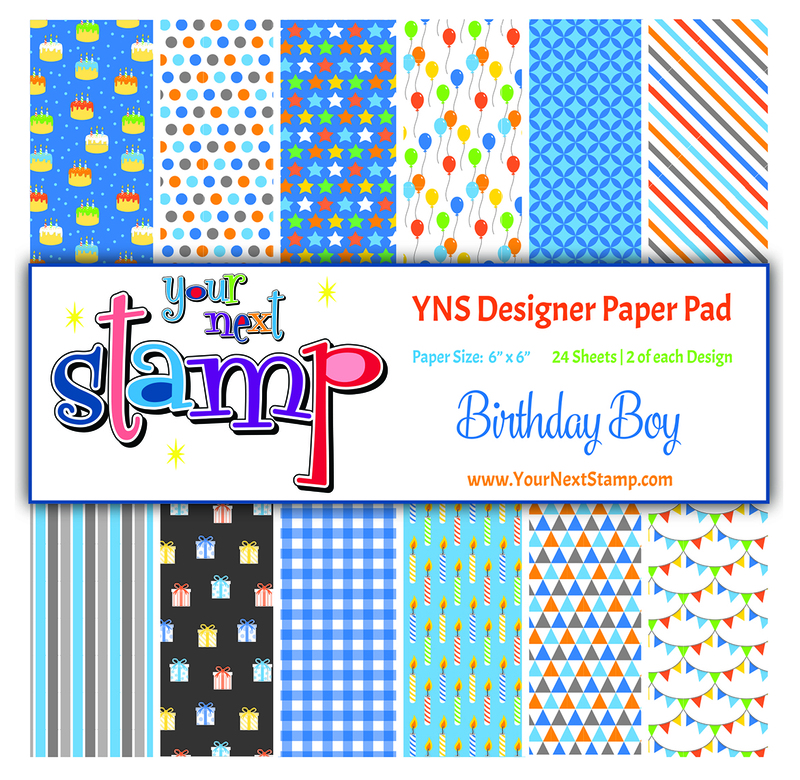 Be sure to stop by the YNS Blog to see all the fun creations and leave a little love. 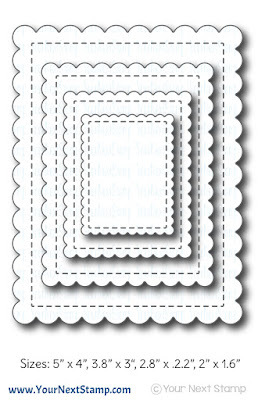 You could win a stamp set of your choice just by leaving a comment. Thanks for stopping by and hope you have a great day! Hi all and happy Friday! It's time for another color and sketch challenge over on the YNS Blog. The colors are so pretty that I couldn't resist using that challenge on my card. 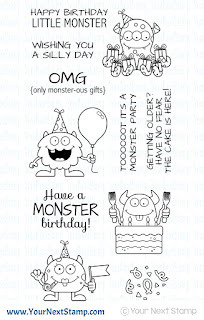 I decided to pull out my Big Birthday Balloon die to create this fun, no stamping balloon card. I started with a white cardstock base and using the newly released Scalloped Rectangle die to cut out the main panel with both craft foam and cardstock. The balloons were cut out using colors to represent the challenge and found that my green got lost behind the blue. I made up that color by using some sparkly green gumdrops from the Fairy Magic collection. The sentiment was cut out using the sentiment die included with the Big Birthday Balloon die, to run across the balloon strings which I used some twine for that. This was a fun card to make and I think could be right up there with a 10-minute card once you have the layout down. Don't forget to stop by the YNS Blog to see all the other fun creations some of the DT members have made. We hope you play along and link up your creation for your chance to win! Thanks for stopping by and hope you have a great weekend! Are you ready for a little color added to your day? Well the DT will not disappoint when you see all the fabulous creations they have come up with for this months DT Dare- Color Me Happy. I hear color me happy and I instantly think of rainbow colors. 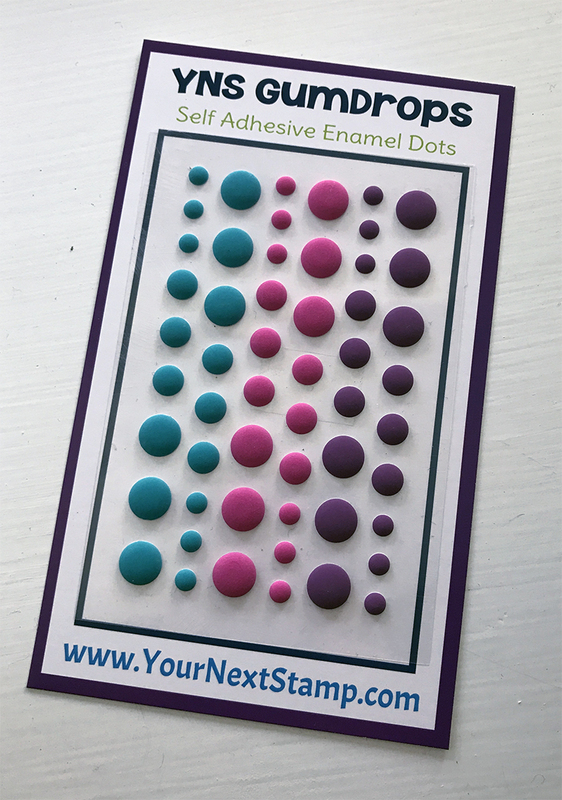 Not sure why, but I do and I couldn't resist using the YNS Funky Line Panel die to create the colorful background of my card. 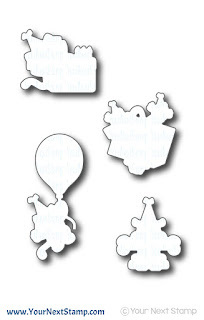 There are so many options in the YNS Store to make a colorful card, but I was instantly drawn to the panel die to start. Using foam tape, I popped up every other piece of the panel for some height before cutting out the 'Happy Birthday' with the newly released Bold Birthday Word die and placing them on top. The card was finished with various colors of gumdrops for an added element. I love the pop of colors against the white and it will certainly bring a smile to someone's face for their birthday. 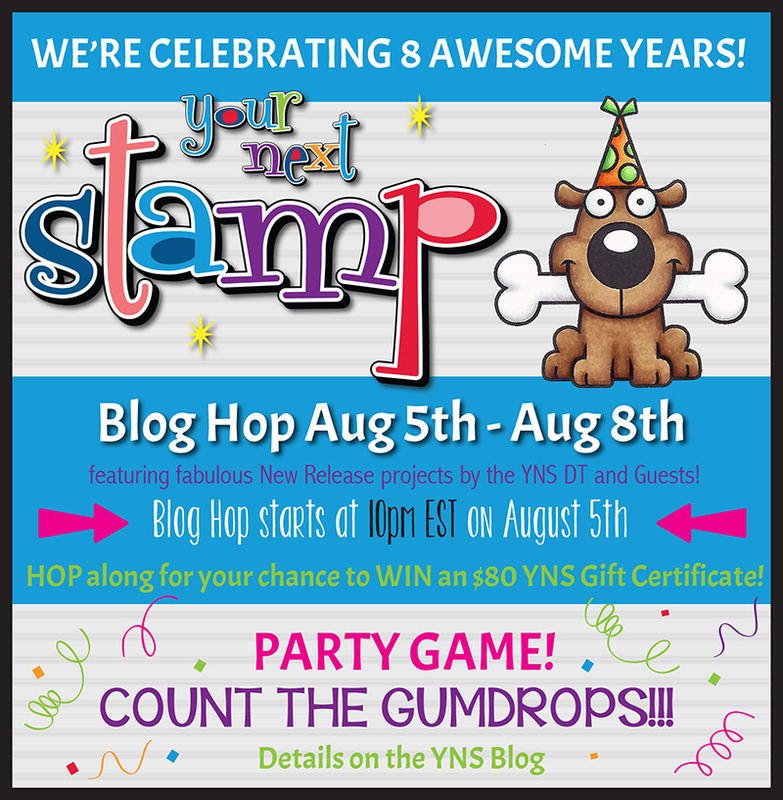 Be sure to stop by the YNS Blog to leave a little love for your chance to win a stamp set of your choice!! Thanks for popping in and hope you have a great Wednesday! It's here! The August release of Your Next Stamp. 8 years of awesome releases!! I just love new releases and being able to share with you all the adorable goodness of each one. And Karen is giving away an awesome prize you can win just by commenting. 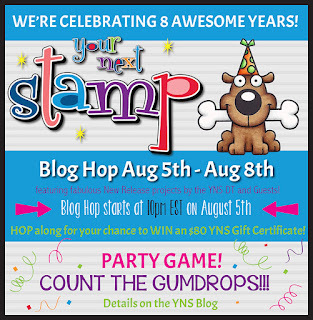 The more you comment, the more you have the chance to win $80 to the YNS Store!! WOWZER! On top of all that, we are playing the gumdrop game where you count all the gumdrops in the DT creations, leave your answer in the special inlinkz at the end of the hop and you could win 10 packs of Gumdrops!! I am actually going to share three cards with you because I really couldn't just do two. 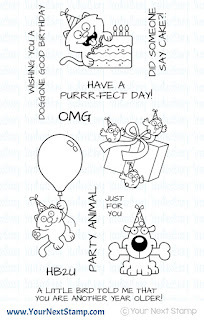 For my first card, I am using the set called Party Pets. Just love these guys! I created this scene using the Scalloped Stitched Rectangle and the new Birthday Boy patterned paper, along with the Stitched Grass die for this cute birthday card. 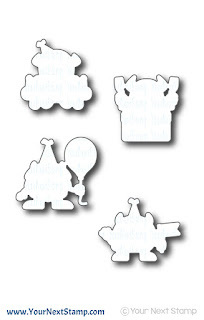 The images were colored with Copics and cut out with the coordinating dies before being popped up with foam tape. 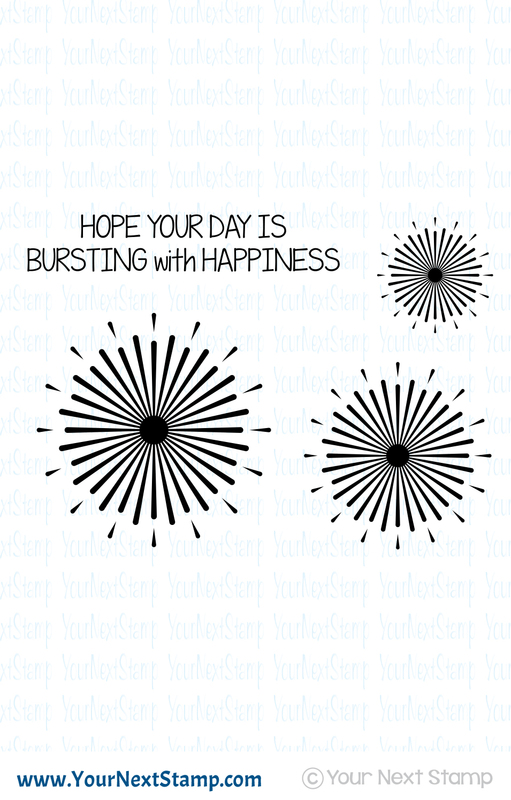 The Starburst Background stamp was used behind the balloon and the sentiment stamped directly onto the panel. My second card is a bit more CAS for this girly birthday card. The Scalloped rectangles and the new Birthday Girl patterned paper was used for the main panels while the image was colored with Copics and cut out with the coordinating dies. The card was finished with the sentiment stamped directly onto the main panel and finished with some of the new Matte gumdrops. 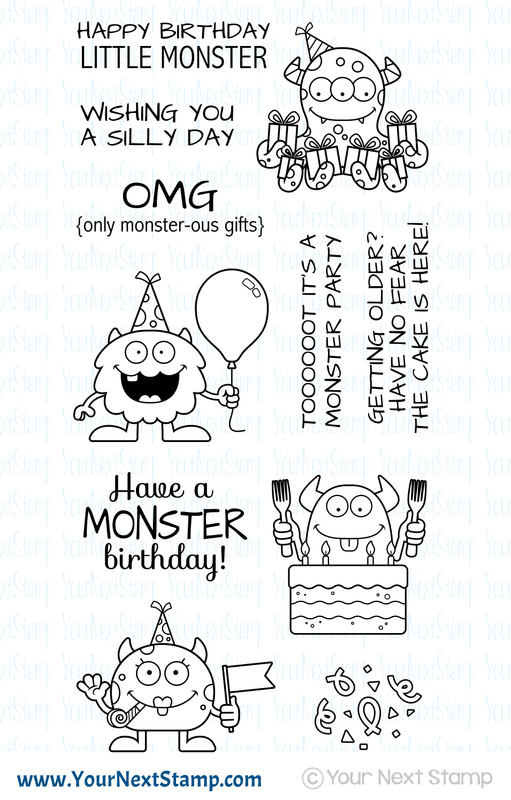 My final card is a shaker card made with the new Bold Happy Birthday dies. The back ground is patterned paper from the Birthday Girl collection with sequins for the inside. A very CAS card but love all the white space. I hope I was able to help in some enabling for you to purchase this awesome release. :) Get your list ready because you can save 20% of your total order! Woot! 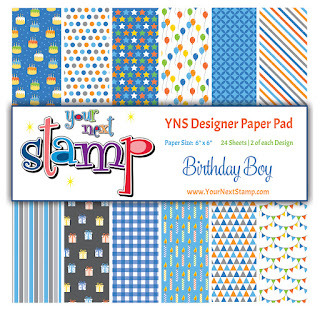 It's time for the Your Next Stamp August new release sneak peek and the DT has not disappointed with lots of inspiration for this awesome release. 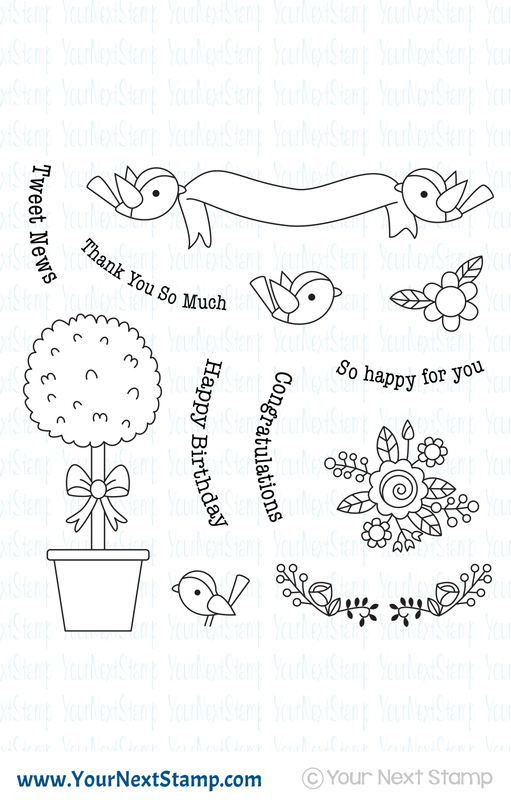 Today I am sharing with you an adorable set called Birdie Banner. 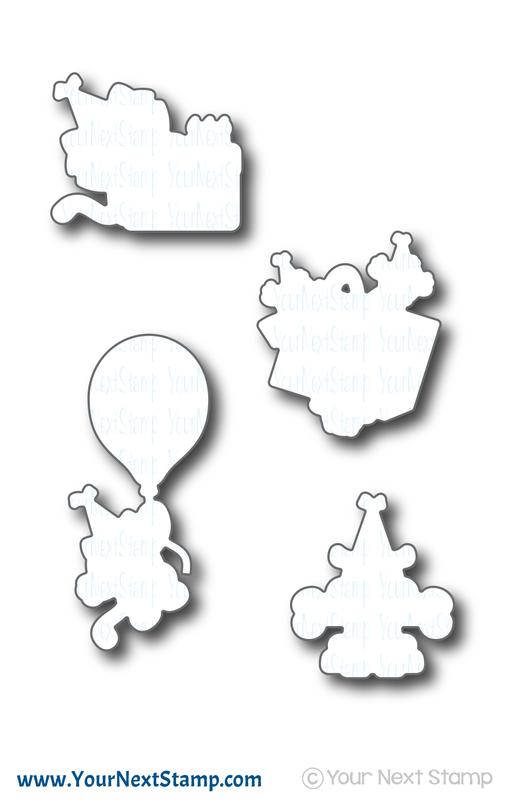 This set can be used for so many projects and I think perfect for tags. I made a card showcasing the banner across some of the new patterned paper called Birthday Girl. The main panel used is the new Scallop Rectangle dies which I then cut out a piece of the center to add some the patterned paper to. The birds were popped up with foam tape while I stamped the corners with the flower and colored them in with Copics. It was then finished with a few of the new Pretty Peacock Matte Gumdrops. 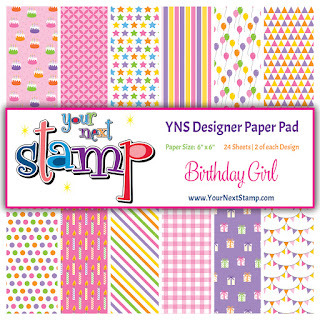 Don't forget to stop by the YNS Blog to see all the fab peeks! And be sure to stop back in later tonight for the full release and blog hop. Have a great Saturday! It's another Friday sketch and color challenge with Your Next Stamp. I used the sketch for my card and had me thinking with the many rectangles and squares it has. 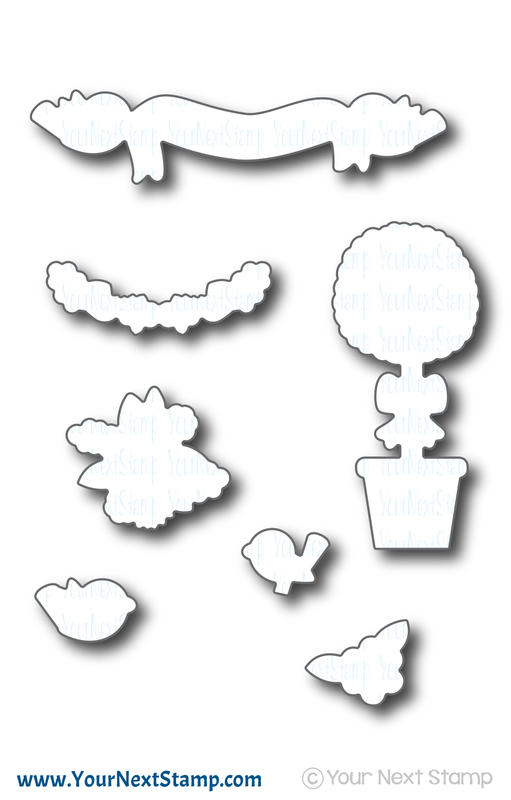 I used the super cute and super fun mini set of Snorkel Fun Penguin. This little guy is so much fun and always makes me smile. For the main panel, I used my Tim Holtz stencil and Distress Inks to make the background before heat embossing some clear embossing powder over it. The image was colored in with Copics and cut out to be popped up over the stenciled background. 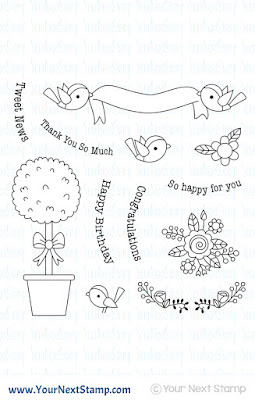 Some patterned paper from the YNS Collection of Hugs and Kisses was used for the back panel with a fishtailed banner for the sentiment to be popped up at the top. The card was finished with some gumdrops as some water bubbles out of the snorkel. 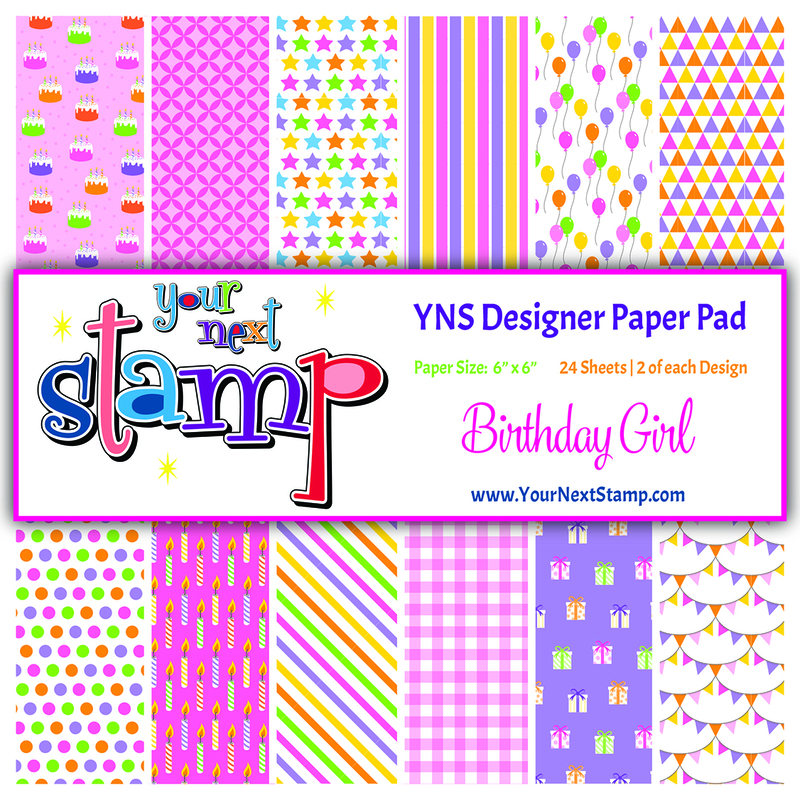 We sure hope you stop on by the YNS blog to see the other DT creations and play along for your chance to win! Just be sure to link up your creation! Thanks so much for stopping by and taking a peek! Don't forget to check back tomorrow for the August new release sneak peek followed by the new release and blog hop later Saturday night! Have a great weekend!